Minimalist range featuring sleek lines and a square design, the Neo Modern Bath Shower Mixer would be suitable for any modern bathroom. Q. Does it have a wall mounted hook? Hi, this bath shower mixer does come with a wall mounted bracket for the hand set. I hope this helps! "Nice bath shower mixer tap, works well, easy to fit, does exactly what they say, spot-on." Look modern, stylish and brillant in my new bath at very reasoable price. Love it. Thanks. Victorian plumbing dellivery service was on time and staff very helpful. Definately recommend this company and will be using them again. 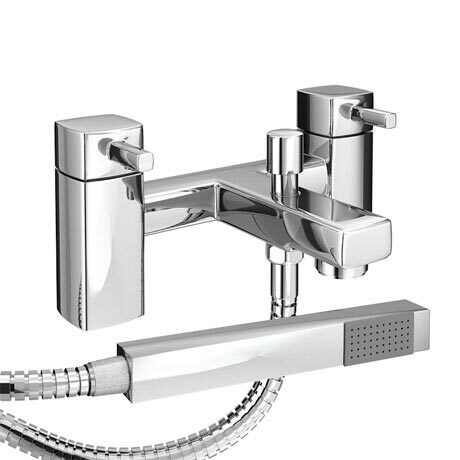 "Neo Minimalist Bath Shower Mixer with Shower Kit - Chrome"
We are so delighted that we chose this Bath Shower Mixer. It was lot cheaper but still excellent. Very, very happy. Very stylish, sturdy and look great. Showerhead gives really good coverage. Would definately recomend. I wish there were more stars to give for price and quality, i really saved my self a fortune and with no comprimise on quality, This is an excellent tap.